I don't want to curse myself, but I thinkkkk I'm in the homestretch of the kitchen remodel? The kitchen now has working electricity (complete with countertop lighting and this beautiful fixture from Schoolhouse Electric), as well as running water, a working dishwasher and a disposal. Honestly, I thought I would be most excited by the dishwasher, but the disposal seems to be taking the cake — it's been years since I've had a disposal, and I've been washing dishes by hand simply out of the sheer novelty of being to rinse eggshells, crumbs and rice leftovers off my plate and down the sink without having to fish out a gross drain filter afterwards. Me. Washing dishes. For fun. This is surely just the start of something great, right? To celebrate the fact that Erlend and I had a functioning kitchen this weekend, we excused ourselves early from a Saturday night party in order to return home to the gleaming kitchen. I prepared us a makeshift charcuterie plate on the kitchen's shiny new gray countertops (yep, the countertops that the granita is sitting on in the pictures) complete with soft brie and Olympic Provisions chorizo salami. Erlend cracked open a bottle of rosé, and we then proceeded to watch Freaks and Geeks in the kitchen's new breakfast nook. And because I'm a lamepants/lightweight who gets buzzed after she has too much Earl Grey tea (you can ask my friend Carroll about this — she'll verify that this is a fact), we ended up with about a cup's worth of wine leftover, enough to make this recipe for boozy granita that I'd spotted earlier this week on Food52 and been dreaming about since. More interesting to me, however, was the fact that the Wikipedia article describes the granita's texture varying between different regions. That is, in parts of Italy, some granitas are as smooth as sorbet, while in others they are coarse and chunky with ice crystals. This is quite the boozy dessert (you can definitely taste the alcohol, even despite being watered down with additional water and blackberry juice), so I would be wary of serving this to children. 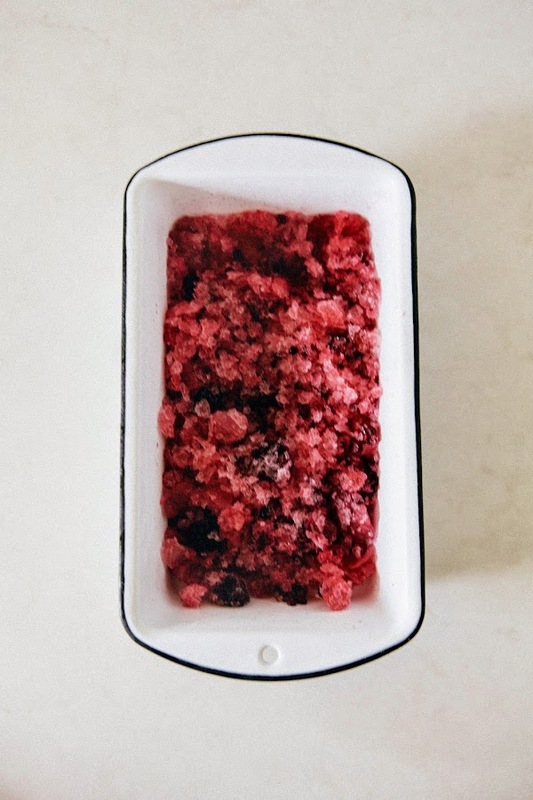 Another thing to note is that the granita melts really, really quickly, so only remove it from the freezer once you've made the whipped cream and you're ready to eat and serve it immediately. For this particular recipe, you'll want a dry rosé wine that’s fresh and acidic, without extra sugar to bury its mineral/fruity/whatever flavors and aromas. You're going to be adding in water and sugar for the granita, so you don't want anything that's already too sweet to begin with. To infuse whipped cream with basil, you're going to need to do some advanced planning. It's best to leave the basil in the cream for at least 3 hours, but preferably overnight. 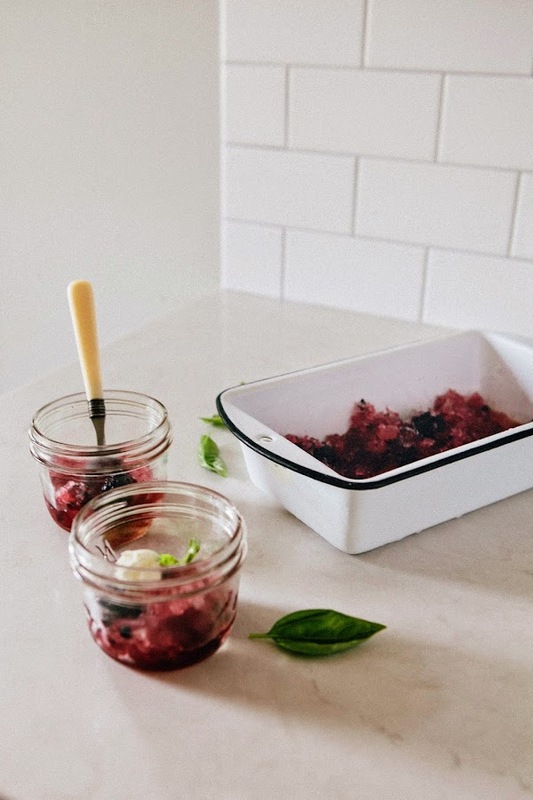 In a medium bowl, use a fork to crush 1/4 cup fresh blackberries until juicy and the fruit has broken up to the consistency of jam. Add 1 cup rosé wine, 1/4 cup plus 2 tablespoons water, and 3 tablespoons granulated sugar to the fruit mixture. Stir together until the granulated sugar has dissolved completely. Pour the mixture into a shallow baking dish and place in the freezer until partially frozen. Use a fork to scrape and break the mixture into shards and crystals. Return the pan to the freezer to freeze completely. Scrape and toss the granita one more time. 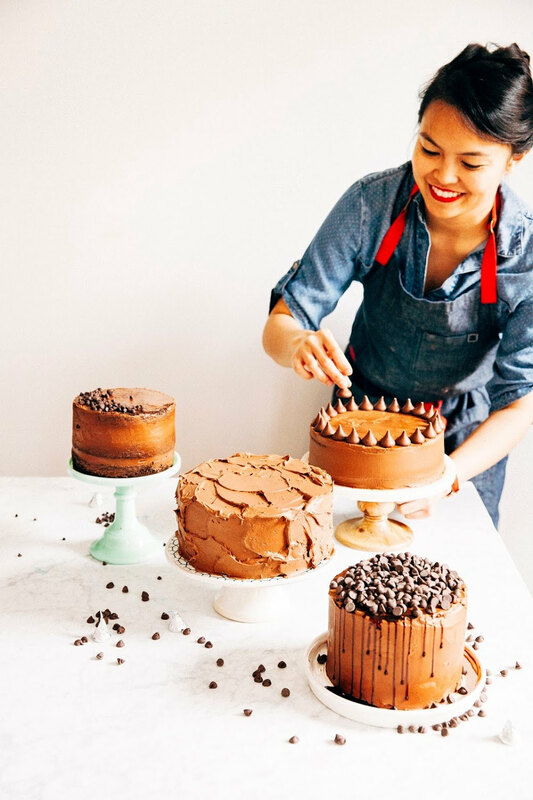 Keep frozen until serving (see baker's notes). In a liquid measuring bowl, combine 1/2 cup heavy cream and 3 to 5 fresh basil leaves (use more for a stronger flavor). Stir gently, gently crushing the leaves into the cream, before covering with plastic wrap. Refrigerate to let the basil infuse the cream for at least 3 hours, preferably overnight. Once the cream has been infused with basil, strain out the basil leaves. 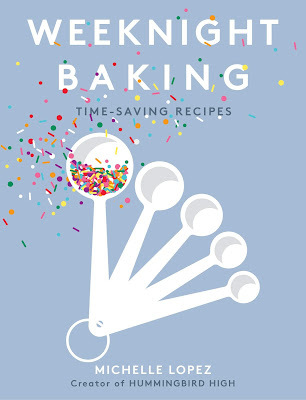 Combine the cream and 1 teaspoon granulated sugar and use a freestanding electric mixer with a whisk attachment or a handheld electric whisk to whip on medium-high speed until soft peaks form. 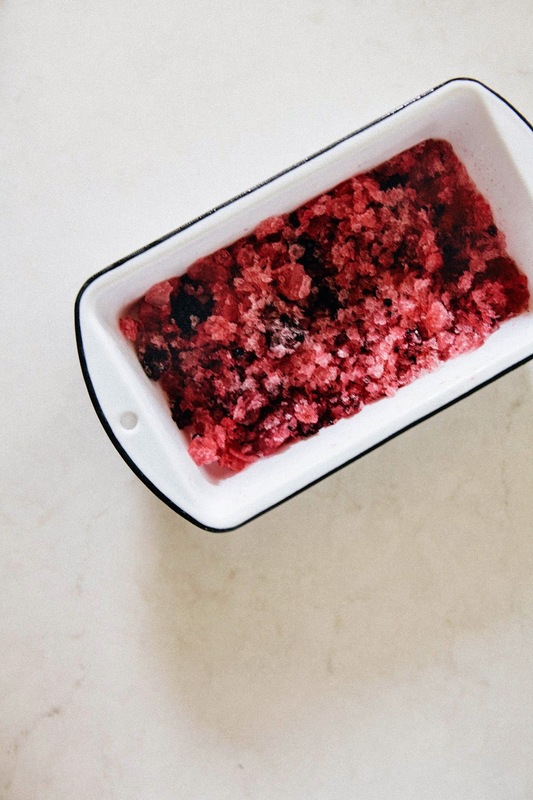 Spoon over the granita and serve immediately. YAY for the homestretch, Michelle!!! (But knocking on wood.) This countertop is gorgeous, and the snippets you've posted on IG are absolutely stunning. And this granita is fantastic -- such a perfect combination of flavors! Basil whipped cream sounds so dreamy. Hope you get your kitchen back soonest!! This is a gorgeous recipe. 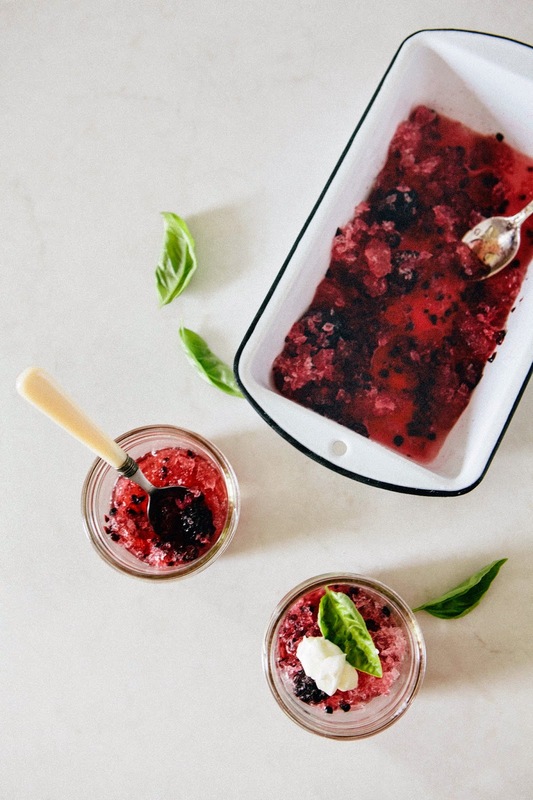 I'm addicted to anything with wine and basil this summer so I can't wait to try this. I love granita! I made a watermelon and black pepper version recently. Sooo refreshing! I love your version with blackberry and rosé and can't wait to try adding whipped cream. i made mango cardamom granita last year..but this one with alcohol sounds very very good. yay for kitchen being almost done. 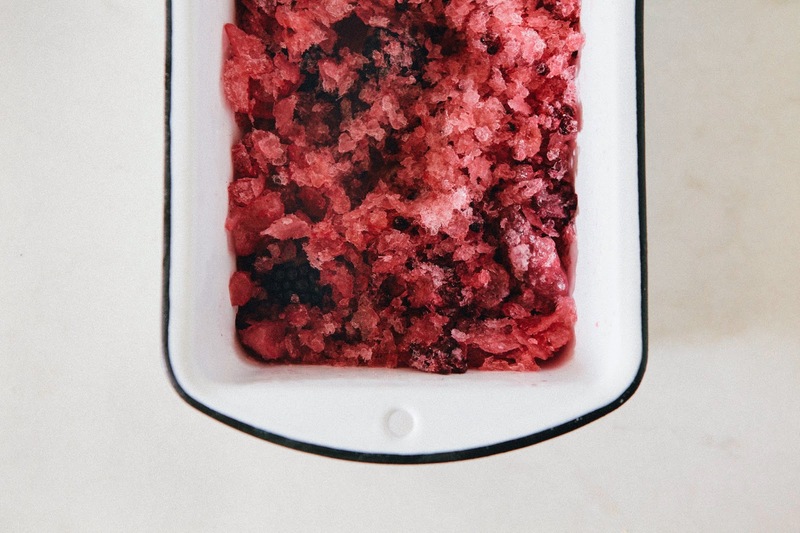 Gorgeous granita! And congrats on the kitchen renovations - could there be anything more exciting?! Hurrah for kitchens! I remember racing home from work on the day our counters were fitted just so that I could stand there stroking them for a while. Too much excitement. Love this granita and the combo of flavours you've used; a perfect blast of late summer goodness. Congrats on the final stretch! So excited for you and your new kitchen! As for that granita, it looks and sounds amazing and refreshing. The basil whipped cream sounds divine and I'm currently thinking about all the things I need to put it on. Best of luck with the homestretch. Yay for the kitchen homestretch! And this granita sounds like a great way to end a hot summer night (now if only the weather would warm up where I am) To heck with it, this would be great anytime! 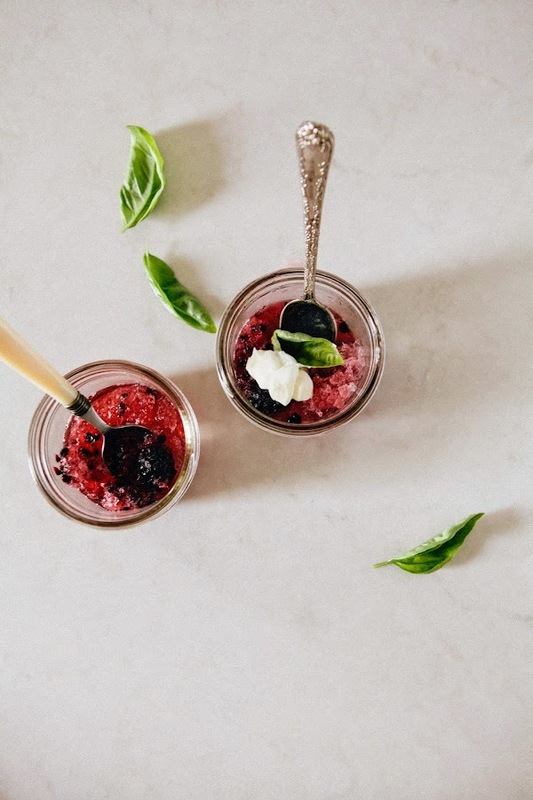 The granita sounds delicious, and yay for your kitchen being almost finished! Can't wait to see pictures when it's all done!